Can you guess what this image represents? 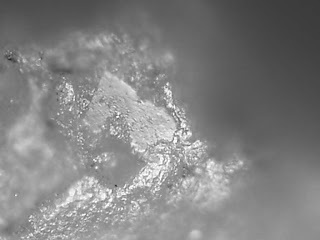 It is the edge of a stone tool under 200x magnification. By comparing this image with experimental tools used on different materials, we know this was used on hard wood. This artifact (see below) is called an “endscraper” or a keeled endscraper. This one was recovered from the Shoop site (36DA20) excavations located in Dauphin County on June 9, 2008. It is made on a piece of Onondaga Chert. This type of stone is very distinctive and is found in western New York, 350 kilometers from the Shoop site. This site is a Paleoindian base camp and it dates to approximately 11,000 years ago. This past summer, over 800 artifacts were recovered in the first ever scientific excavation at Shoop. 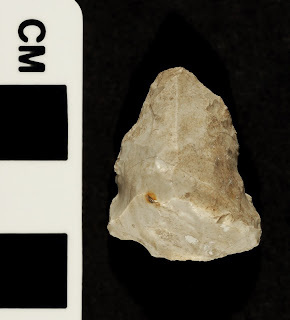 Although endscrapers can be found at sites dating to later times, they are especially common during the Paleoindian Period, (11,000 to 10,000 years ago) and the Early Archaic Period, (10,000 to 9,000 years ago). Some sites, Shoop among them, contain hundreds of these tools. Typically, they are small and triangular in shape. They are called endscrapers because the working edge is along the distal end of the flake, opposite the striking platform. The lateral edges have been shaped so it could be inserted into a wooden or bone handle. Some are notched as part of the hafting process. We assume that these tools would have started out several inches long and that they were used in handles. This one has been re-sharpened to the point where it is too small for further use. Their function is problematical. Their steep edge attests to their scrapping function but the material that was being scraped is usually debatable. Similar tools were used by the Inuit (Eskimo) to clean animal hides for clothing and shelter. Many archaeologists feel these were used during the Paleoindian Period to clean caribou hides. However, based on the microscopic analysis just completed on this tool, we now know it was used in working a hard wood, possibly in the manufacture of wooden handles. The McFate site (36Cw1) located in Cochranton, PA was excavated in 1938 by Harry L. Schoff under the Works Progress Administration (WPA) from funding received under the New Deal Program. Thousands of artifacts were uncovered and evidence of the palisades of three over-lapping villages were discovered. The site was identified as belonging to the Late Woodland time period, or 1,200 to 450 years ago. Schoff recorded 448 refuse/storage pits during his investigations and one half of this smoking pipe was recorded from the excavation in 1938. In 1968, a group of amateur archaeologists from the local chapter of the Society for Pennsylvania Archaeology began reinvestigating the grounds of the McFate site prior to construction of a new housing development. 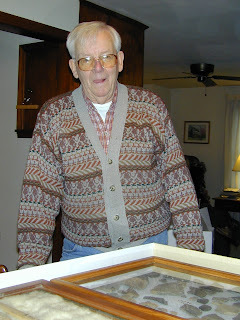 Mr. Ray Stewart discovered the second half of the pipe more than thirty years after Schoff’s original discovery. 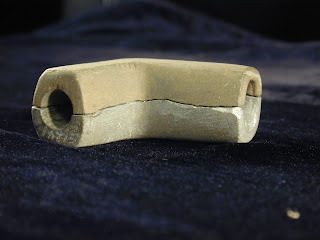 After receiving Mr. Stewarts’ generous donation, the pipe fragments were compared and the refit confirmed that these indeed were two pieces of the same pipe. The pipe measures 8.9 cm overall with one leg slightly longer than the other. It is made of a fine grained siltstone and contains no residue indicating it was probably never used. For more information on additional sites excavated as part of the WPA see our New Deal website. Archaeologists often comment about discoveries being made in the lab, long after the actual digging of a site has ended. They also lament that practice of archaeology in many cases poses more questions than it answers. This artifact is a prime illustration of both phenomena. Excavated by Louis Berger Group, Inc. from the Metropolitan Detention Center Site (36Ph91) at 7th and Arch Streets in Philadelphia prior to the construction of a federal prison, this artifact is a fragment of window lead, also called turned lead. Originally H-shaped in cross section, it would have held individual panes of glass together to form a complete window. Correctly identified by Berger staff, it was not until the collection was submitted to the State Museum of Pennsylvania’s Section of Archaeology for curation that the discovery of a date flanked by two pairs of initials stamped on the inside channel was made. In the image “EW 1701 TD” can clearly be seen. Other instances of window lead with dates and initials have been found at archaeological sites at such as Jamestown, Flowerdew Hundred, and Williamsburg. Closer to Philadelphia, excavations in Trenton at the Lambert/Douglas House conducted by Hunter Research, Inc. prior to highway improvement construction also yielded fragments of window lead, at least one of which bore initials and a date. Incredibly, the initials and date on the fragment from the Lambert/Douglas House are identical to those found on the fragment from the Metropolitan Detention Center Site. Unfortunately, neither the individual artisan/tradesman nor the manufacturer have yet to be identified. Nevertheless, these two finds, and their undeniable relationship to each other, open the door for questions and discussion concerning the manufacture of and distribution systems for building materials (and other goods) relatively early on in the European colonization of America and the permanent settlement of the lower Delaware River valley more specifically. 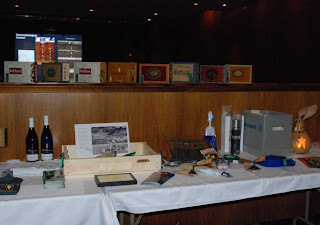 Here's some photographs from today's events at the 80th Annual Meeting of the Society for Pennsylvania Archaeology. If you have any photos, feel free to send them along to RA-hm-webmaster@state.pa.us and we'll be happy to inclue them! 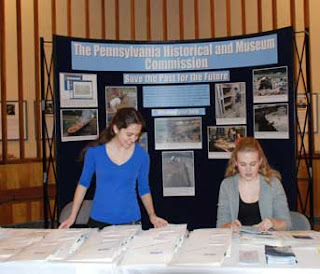 Volunteers at the registration table at The State Museum. 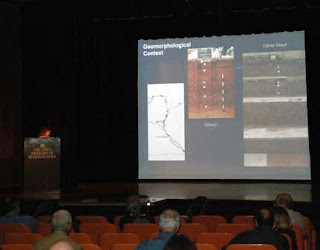 One of the presentations taking place in the auditorium. 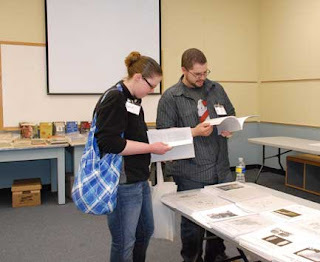 The book room features all kinds of publications for archaeologists, available for purchase. Auction items are all set out for viewing. The auction happens tomorrow, Saturday April 4th at The State Museum.